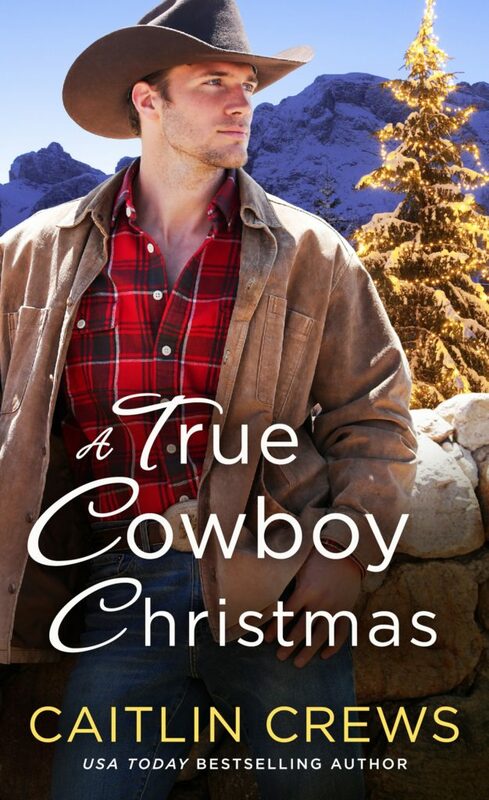 From USA Today bestselling author Caitlin Crews comes A True Cowboy Christmas, the first in a sensational series debut about a cowboy, a farm girl, and the greatest gift of all. Gray Everett has a heart of gold but that doesn’t mean he believes in the magic of Christmas. He’s got plenty else to worry about this holiday season, what with keeping his cattle ranch in the family and out of the hands of hungry real-estate investors looking to make a down-and-dirty deal. That, plus being a parent to his young and motherless daughter, equals a man who will not rest until he achieves his mission. Now, all Gray needs is the help of his lifelong neighbor. . .who happens to have grown into a lovely, spirited woman. For Abby Douglas, the chance to join forces with Gray is nothing less than a Christmas miracle. Much as the down-to-earth farmer’s daughter has tried to deny it, Abby’s been in love with stern, smoking-hot Gray her whole life. So when Gray proposes a marriage of convenience as a way to combine land—and work together toward a common cause—Abby can’t refuse. But how can she convince Gray that sometimes life offers a man a second chance for a reason. . .and that their growing trust and mutual passion may be leading to true and lasting love? A True Cowboy Christmas is a fantastic story from start to finish, a tale of second chances, hope and trusting in the future. Gray has had a rough past, his marriage was rocky at best and full of lies. The only good thing to come out of his marriage was his daughter, a child far too old for her years. Combine this with an extremely rough childhood and broken relationships with his siblings, you have a man who finds it hard to open up, hard to trust and someone who no longer believes in love and romance. His neighbour, Abby, has been in love with him for as long as she can remember. While others ran away from their small home town, she stayed where her heart felt like it belonged and took care of her elderly family (her Mother was always coming and going out of Abby’s life). The two individuals have so much in common in their history but unlike Gray, Abby still hopes for the future and of love that will last. Gray proposes one of the craziest arrangements ever to Abby – a marriage of almost convenience, she takes care of the home and his daughter and he takes care of the ranch. While it looks great on paper and comes out completely wrong, Abby never the less accepts his proposal and the two stumble down a rocky path of attraction and denial. Abby seems determined to make this work and while Gray is extremely attracted to her, he puts a rock where his heart is and will not let him feel any emotion, which was almost frustrating at times. Every step Abby takes forward with him, he is determined to take the couple two steps back. It isn’t until he is firmly woken up about his behaviour to Abby, his brothers and his daughter, that he is forced to take a step back and look at himself and it was a self he wasn’t happy about but would it be too late, did he ruin things so greatly with the people in his life that matter the most? This is a lovely story about looking inside of ourselves, having the courage to push past the pain and our past in order to accept a future of love and happiness that we all deserve. Sometimes our past leaves such dark stamps on our lives but we should never allow this to create our future. This is a fantastic story that I could not put down. USA Today-bestselling, RITA-nominated, and critically acclaimed author Caitlin Crews has written more than seventy-five books, including Frenemies, Princess from the Past, A Royal Without Rules, and Undone by the Sultan’s Touch. She’s won fans with her romance, Harlequin Presents, women’s fiction, chick lit, and work-for-hire young adult novels, many of which she writes as Megan Crane (including the dystopian Viking romance Edge series). These days her focus is on contemporary romance in all its forms, from small town heat to international glamour, cowboys to bikers to military men and beyond. She’s taught creative writing classes in places like UCLA Extension’s prestigious Writers’ Program, gives assorted workshops on occasion, and attempts to make use of the MA and PhD in English Literature she received from the University of York in York, England. She currently lives in the Pacific Northwest with a husband who draws comics and animation storyboards, and their menagerie of ridiculous animals.